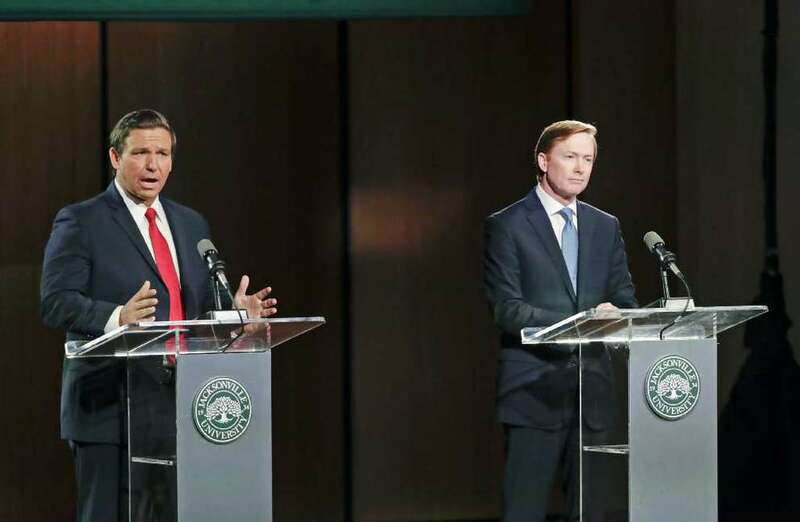 The Republican gubernatorial rivals went after each other in Wednesday night's second and final debate at Jacksonville University. 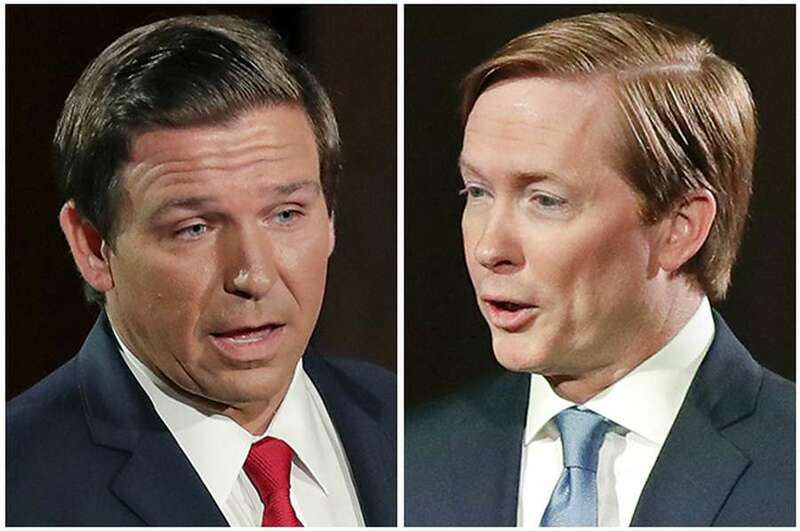 Adam Putnam is a career politician who will say and do anything to win and an errand boy for U.S. Sugar, Ron DeSantis declared in a televised gubernatorial debate between the two GOP rivals on Wednesday night. DeSantis is a "Seinfeld candidate" whose campaign is all about nothing, Putnam said. He knows next to nothing about Florida issues. "You've run for three offices in three years. That's a career politician with (attention deficit disorder)," the agriculture commissioner said in response to DeSantis repeatedly calling Putnam a life-long politician. RELATED COVERAGE: And the winner of DeSantis vs. Putnam? Trump! Held at Jacksonville University and televised across the state — but not in Tampa Bay — the second and final Republican primary debate for governor included particularly sharp exchanges about environmental policy and the blue-green algae bloom crisis afflicting large swaths of Florida. "Adam is basically the errand boy for U.S. sugar. He is going to stand with them time and time again," said DeSantis, who contends the sugar industry deserves much of the blame for Lake Okeechobee's algae problem and dismissed the impact of septic tanks on the crisis. "I will stand with the citizens of southwest Florida," DeSantis said. "I will stand with the citizens of the Treasure Coast." The debate was emblematic of the two candidates' styles — one running a traditional campaign with stump speeches, policy papers and barbecue rallies, the other relying largely on his association with President Trump, personal biography, and appearances on Fox News to trump local issues. Putnam cast DeSantis as a creature of Washington who knows little and "plays hide the ball" with his plans for Florida. "You can take everything that my opponent knows about water and put it on your sticky note and still have room left for your grocery list," Putnam said. "You couldn't find Pahokee and South Glade on a map," he added, referring to communities near Lake Okeechobee. "Why is it that you're denying the fact that 21 million people on a peninsula … is playing a role in addition to industry?" PREVIOUS COVERAGE: We know Ron DeSantis is with Trump. But where is he on Florida issues? An endorsement from Trump catapulted DeSantis into the frontrunner for the nomination. Putnam again praised the president's agenda Wednesday, but said that, unlike the President, DeSantis is campaigning without telling Florida voters what he actually wants to do as governor. "He ran on a plan. You're running on an endorsement," the Bartow Republican said. "I can't imagine a world where you run for governor from the third largest state and never offer any ideas. No plans, no specifics, no agenda for what you're going to do." DeSantis, 39, largely ignored the criticism of his nebulous policy agenda but not Putnam's repeated references to the congressman being a Washington politician. "When he was in Washington, his career was a doozy," DeSantis said. "Voting to bail out the Wall Street banks, voting for Cash for Clunkers, Obama's boondoggle program, voting to bailout Fannie Mae and Freddie Mac. That is not what we need in Florida, that record." Putnam hammered DeSantis' support for the so-called Fair Tax, a proposal to eliminate most federal taxes and instead put in place a 23 percent national sales tax. Putnam said that would especially hit hard Florida seniors who paid those other taxes their whole lives. "It may sound good in a Harvard economics classroom, but it is bad for seniors, it is bad for Florida's real estate market," Putnam said, taking a shot at DeSantis' alma mater. DeSantis replied that the "lefties at Harvard would hate the Fair Tax. You know why? It totally puts the lobbyists out of business." He added that Putnam has run ads that distort the Fair Tax. "If he's willing to misrepresent (the fair tax)," DeSantis said, "what makes you think as governor that he would actually level with you and tell the truth?" News4Jax anchor Kent Justice asked both candidates if they think health care is a right. Neither did. "If you believe that, where does it stop?" Putnam said. Replied DeSantis: "I think people should have the right to pursue the type of healthcare they want." Contact Adam C. Smith at [email protected] Follow @AdamSmithTimes. Contact Steve Contorno at [email protected] Follow @scontorno.